Lit up at dusk, the facade if the Bellagio Hotel and Casino in Las Vegas presents a majestic sight. The hotel is fashioned along the lines of the Lake Como Resort in Bellagio, Italy. 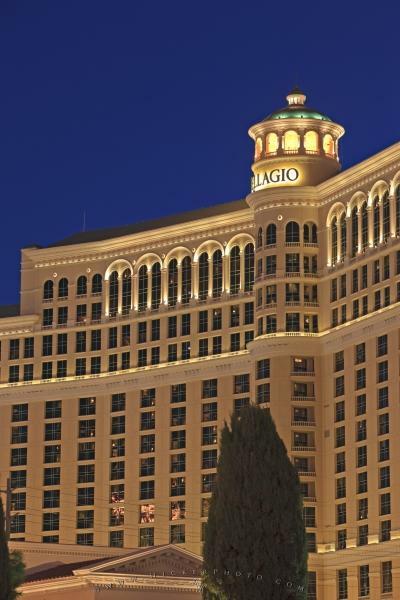 A striking facade, the Bellagio Hotel and Casino was inspired by the Lake Como resort town of Bellagio in Italy. The Bellagio Hotel and Casino is situated along the famous Las Vegas Strip and features an 8 acre lake where the water show takes place during the day and into the evening. At dusk the lighting is exquisite. dusk in the City of Las Vegas.